To avoid crowds and enjoy Venice at its best, put on your jacket and visit during the city's relatively mild winter months. 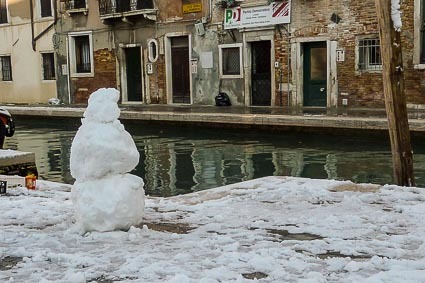 ABOVE: A snowman poses alongside a Venice canal. The most pleasant time for a trip to Venice is in the winter, when tour groups are mostly absent and daytrippers are at home. You can see that the number of visitors in the quietest month (January) was less than 38 percent of the visitor count during the busiest month (July). For the five-month period from November through March, visitor traffic was about about one-third of tourist visits from May through September. The contrast is even more extreme if you study the numbers for foreign tourists alone. In January, there were about 337,000 foreign tourists; in July, there were 1,065,000. In other words, there were only 31.6 percent as many foreign visitors in January as there were in July. We suggest coming any time from November through March except for holiday periods (e.g., Christmas through New Year's or Easter) and Carnival, unless you're willing to endure crowds and pay a premium for your hotel or vacation apartment. January is especially nice, once you get past New Year's Day. Very few tourists are in town, and you can enjoy Venice as it was before the era of mass tourism. Bonus: By coming to Venice out of season, you're almost sure to save money on your hotel or vacation apartment. If you're a native of Phoenix or Bangkok, you may find Venice too chilly for comfort during winter, but if you come from a more northerly climate, you may be pleasantly surprised. Even in January, Cheryl is quite warm in a wool coat (such as a Loden coat), and Durant is comfortable in a shell parka with a fleece sweater underneath. Snow occurs now and then (see photos of a March snowstorm on page 4), but rain and the occasional fog are seen more often than snowflakes. Fun fact: January, February, and March have less precipitation than July, August, and September do. Acqua alta, or tidal flooding, is a uniquely Venetian phenomenon that you might encounter between November and April, although it can occur at any time of the year. It affects low-lying areas of the city, especially around the the Piazza San Marco, but the flooding recedes with the tide. For month-by-month Venice weather statistics, including temperature and precipitation, see Weatherbase's Venice pages (both Imperial and Metric versions). Fifteen or 20 years ago, it wasn't uncommon for hotels and other tourist businesses to shut down in late December or early January. That still happens occasionally, but for the most part, anything that's open in summer is likely to be open in winter, except for outdoor restaurant terraces. Often, you can even sit at outdoor café tables in good weather. Note: Alilaguna airport boats and ACTV water buses operate year-round, but a handful of routes are seasonal, which means they don't run from late fall through early spring. To learn more about Venice in winter, see our captioned winter photos on the next three pages. These are grouped by topic (no clickbait slide shows! ), and we've put them on separate pages so you won't be forced to download them if you're on a slow or expensive cellular connection.